Your answers will help improve care for people who live with dementia. 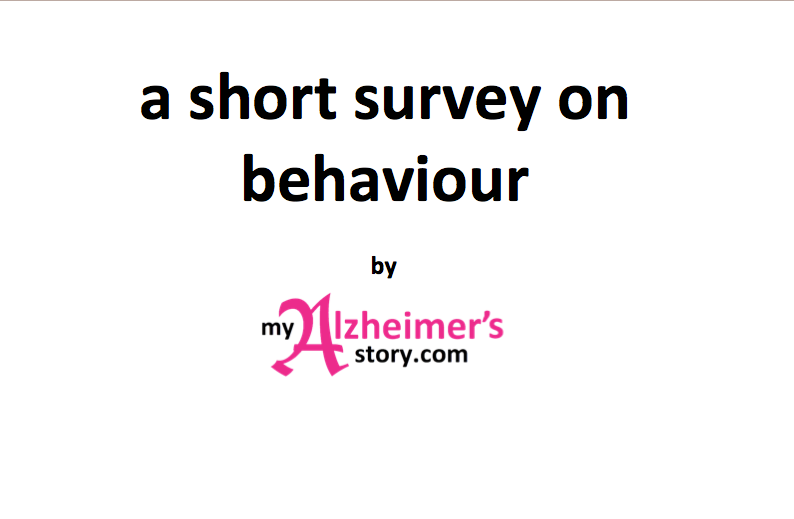 This is a short, anonymous and ongoing survey on behaviour, which takes 3 - 4 minutes to complete. Many people say it has made them think differently about the way people who live with dementia behave. You will be able to see the results immediately after you complete the survey by clicking "Done." If you have a problem seeing the survey, or some of the questions are cut off, please try changing your browser or using a different device. Thanks you for participating. I invite you to distribute this survey as widely as possible using any means you wish and to use it as a tool to change minds and create better dementia care . * 1. If a stranger tried to take your clothes off, would you resist? * 2. Do you ever become upset or lose your temper? * 3. If you found yourself in a new or unknown environment, might you spontaneously explore it? * 4. Do you ever wake up in the night? * 5. Do you ever talk, mutter, or mumble to yourself? * 6. Do you ever engage in behaviour that might not be in your best interest? * 7. What would you do if someone tried to make you take drugs you didn't want to take? * 8. If you were physically threatened, might you hit, slap, kick, bite, or push someone to defend yourself? * 9. If you had to sit for long periods of time with nothing to do, might you become restless, want to get up or start to fidget? * 10. Do you ever have difficulty falling asleep? * 12. Do you ever say things that don't make sense? * 14. Have you ever screamed, yelled, or moaned loudly? * 15. Do you ever argue, threaten, or curse? * 17. Do you ever complain about your health? * 19. Have you ever seen or heard things that turn out to be something other than what you thought they were? * 20. Have you ever woken someone else up in the night? * 21. If you were confined against your will, would you try to find ways to escape? * 22. Have you ever mistakenly accused someone of doing something they didn't do? * 23. Have you ever asked for attention or help? * 24. Are you ever uncooperative? * 25. If you were bored, might you try to find something to do? * 26. If you were physically restrained against your will would you try to get free? * 27. Do you ever complain? * 28. Have you ever repeated behaviour other people say doesn't make sense, but that makes sense to you? * 29. Do you ever do things that others might think is risky, but that you think is safe? * 30. How long could you sit in a chair with nothing to do before you would feel restless, want to get up or start to fidget? * 31. Are you male or female? * 33. In what country do you currently reside? * 35. Do you have or have you had any role in dementia care? As the survey is anonymous, I have no way to communicate directly with respondents. If you wish to see the results of the survey when they are published later in 2017, please go to the link after you click "Done," and contact me using the contact form. Thanks.